Sen. Mazie Hirono (D-Hawaii) joined Sens. Barbara Boxer (D-Calif.) and Ben Cardin (D-Md. ), left, to highlight the government shutdown’s damaging effects on the environment and public works projects. Hirono emphasized the risk of delaying projects in the Pearl Harbor Naval Shipyard and the negative effect on Hawaii’s many wildlife refuges. WASHINGTON — Sen. Mazie Hirono (D-Hawaii) voted Oct. 16 to end the government shutdown and pay the nation’s bills. “It should be clear that dysfunction is not the proper way to govern,” she said. “We cannot continue to lurch from crisis to crisis every few weeks or months. An extreme faction in Washington thought that Congress’ basic responsibilities were viable negotiating chips and put our nation on the precipice of default. “The shutdown was senseless and hurt people and businesses in Hawaii and across the country, resulting in layoffs, lost wages and uncertainty for families. Through this bipartisan deal, the federal government will be funded through Jan. 15, 2014 and will have its borrowing authority extended until Feb. 7, 2014. The House and Senate have also agreed to appoint a committee to negotiate a budget by Dec. 13, 2013. Standard & Poor’s estimated that the two-week shutdown cost the U.S. $24 billion in potential economic activity. Another report estimates that Congress’ budget fights, debt-ceiling stand-offs, and spending cuts have cost the nation nearly $700 billion in lost economic activity. 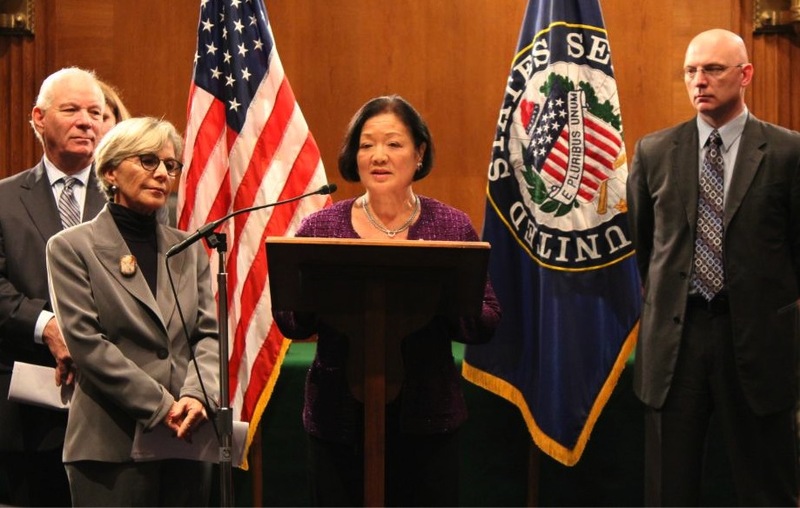 Throughout the shutdown, Hirono shared stories from Hawaii families on how the shutdown impacted them, speaking most recently at a press conference with colleagues and on the Senate floor. Following are comments from Asian Pacific American members of the House, where a measure to reopen the federal government immediately passed by a vote of 285-144. Rep. Tulsi Gabbard (D-Hawaii): “For more than two weeks, hard-working families, veterans, and federal workers have suffered due to partisan fights which cost our economy $300 million per day. I am relieved that we are finally moving forward today with a bipartisan agreement that will protect our economy and allow time for a larger agreement on a long-term budget and fiscal plan. Rep. Colleen Hanabusa (D-Hawaii): “I want to thank Senate Majority Leader Harry Reid and Minority Leader Mitch McConnell for crafting this compromise, and Speaker of the House John Boehner for bringing it to the floor for a vote. This has been a tremendously trying time for Congress, our federal workers, and our nation, but I am glad that cooler heads have prevailed and we have resolved these issues for the time being. “While the deal wasn’t perfect, it allows us to move forward without doing further damage to our nation or our economy. I hope that the time this provides us will allow Congress to finally address many of the pressing economic and policy issues we face regarding funding priorities, overall spending, and the tough but necessary work of crafting a responsible but effective federal budget. My main concern right now is that we do not take this as an excuse to lurch toward another self-imposed crisis because we are unable to address core issues. Rep. Doris Matsui (D-Sacramento): “We cannot continue to legislate by crisis. The American people expect more, and they deserve better. I am pleased that the House voted this evening to pass the Senate compromise bill that will reopen our government and avert a default that would risk the full faith and credit of the United States. “This bipartisan compromise is crucial for the American people and our economic growth, putting an end to the damage from the House Republicans’ irresponsible strategy to hold the government and our economy hostage. Now we must move past this impasse and the political brinksmanship and get back to doing the work of the American people. Rep. Mike Honda (D-San Jose): “I am pleased that cooler heads in the Senate have prevailed with a bipartisan deal that allows the federal government to reopen, albeit temporarily, and removes the specter of reaching the debt ceiling until February. “Obstructionist Tea Party Republicans held the government and the American people hostage for 16 days and threatened the full faith and credit of the United States, all in a misguided, failed effort to deny millions of Americans access to health care. This process has done lasting damage to the public’s trust in Congress, as governing should not involve lurching from one manufactured crisis to the next in the hopes of extracting concessions in exchange for not destroying the economy. Rep. Mark Takano (D-Riverside): “I’m pleased to see that Congress has passed legislation that will reopen the government and ensure that America will not default on its debts. This deadlock has done great damage to our nation and no one has suffered more than the American people, as the shutdown has cost taxpayers $4.8 billion and furloughed nearly 800,000 Americans. Shutting down the government or threatening America’s ability to pay its bills should never be used as a tactic for achieving a political end. Congress can no longer limp its way from manufactured crisis to manufactured crisis and I hope that this agreement will usher in the return of regular order, a process that the legislative branch has operated under for decades. Rep. Tammy Duckworth (D-Ill.): “For the past 16 days, my neighbors and all Americans needlessly suffered from a government shutdown and fear of a U.S. default on our national debt. Small businesses in my district had SBA loans and contracts with the government delayed. Federal employees who honorably serve our country went without paychecks and veterans had many of their programs suspended. Tragically, even death benefits for family members of our fallen military heroes were put on hold. The American people deserve better. “It was absolutely essential that Congress vote to reopen our government and raise the debt ceiling and I am relieved that we can move forward as a nation. Now, the real work of creating a budget that invests in our economy and reduces the national debt begins. “We must invest in our nation’s transportation and infrastructure. We can pass immigration reform that is supported by the overwhelming majority of the American people. We can cut waste and fraud at the Pentagon and in Medicare to help reduce the deficit. Rep. Grace Meng (D-N.Y.): “It is long overdue, but the federal government is open and the debt ceiling is raised. This is a welcome development for our country, but the damage caused is irreversible and was completely unnecessary. “Without repealing, delaying, or defunding the Affordable Care Act, reasonable elected officials were able to avert a crisis that would have plunged the U.S. into another economic abyss, possibly worse than the Great Recession. We’ve ended the nightmare that took an enormous toll on millions of Americans, and I hope those who led us there will never do so again. “Furloughed federal employees can get back to work, and mothers, children, veterans and seniors will once again receive vital services that should have never been so callously taken away. “I hope the resolution to this shutdown is representative of the progress Democrats and Republicans will be able to make during the upcoming budget negotiations. We can solve the great problems facing our country, but we must resist the political extremists that will undoubtedly attempt to hijack the process again. Politics is the art of compromise, and rather than waging futile battles, both parties need to come together for the good of our country. “The deal that we passed should have been approved on Sept. 30. But now that the shutdown is over and default has been avoided, we must get back to conducting the business of the American people, and solving the many important problems Americans need us to fix.